The players were super and got the crowd going from the beginning. We will want to do it again next year. The show was fabulous!! Everyone loved it, sounded awesome. We raised the most money that night of any previous event. Very excited for the Mako Foundation. We had so much fun. I received a lot of good feedback, everyone really enjoyed the show! Thanks! Everything on Saturday was fantastic! The guys were amazing, and my parents and their friends loved it! I think the group was a bit unconventional in the sense that vocally the audience participation was low, but there were a lot of dancers. I hope that was ok with them because they were terrific!Thank you for everything all of you did for my mom and her birthday! Hope to use you again someday! 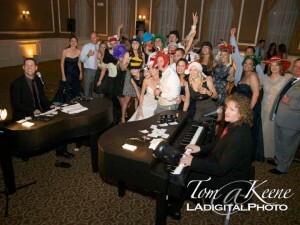 I felt it was a risky move to call on dueling pianos for our corporate holiday party, but the concept worked out. Our team absolutely loved it. It was refreshing to see senior level managers dancing, singing and having a ton of fun. I’m looking forward to the next opportunity to hire 176 Keys again. They can really work a crowd. What a great team of friendly, customer service oriented people. 176 went above and beyond to make sure my company holiday party went off without a hitch. The talent was impressive and our party was a blast. Thanks so much for raising the bar! The BEST party EVER!!!!!!! The guys were amazing and so much fun!!!! It was great! The pianos were a hit, guest loved them and impressed on how the guys could play anything! We both want to thank you for an amazing performance at our wedding! We had a great time and our guests were still talking about the big night the next day. Hopefully this can translate into additional business for you in the future. Thank you again!